If only you could plug a stove into Sonny Landreth's electric guitar, dinner at the World Cafe Live would be smoking hot. But while we shimmied to the mesmerizing growl of the Louisiana bluesman's Stratocaster, it was also clear the kitchen here was still fumbling to find its groove. We felt relieved to have eaten our dinner at all, given that we'd just spent the first 40 minutes of the opening act at a table out of stage view on the mezzanine waiting for our first course to arrive. When it finally did, it hardly seemed worth the anticipation. The fried-oyster wrap sandwich was stuffed mostly with shredded lettuce. The handful of oysters we did find were so suffocated by spongy breading, they could have been mistaken for chicken patties. The olive oil-slicked hummus was acceptable for a pre-concert nibble. But the trough-sized bowl of macaroni-and-cheese brought a bland wallop of cheesy goo, with hardly a spark of the tang its "pecorino pepato" pedigree conjured. It is nearly an impossible proposition from the start to envision a setting where top-notch food and music can happily coexist. But this ambitious new performance venue near the river's edge of University City is closer - at least in concept - than some might think. Developer Hal Real has converted the massive art-deco building structure off Walnut Street, a former plumbing parts manufacturing plant, into a dynamic music multiplex. 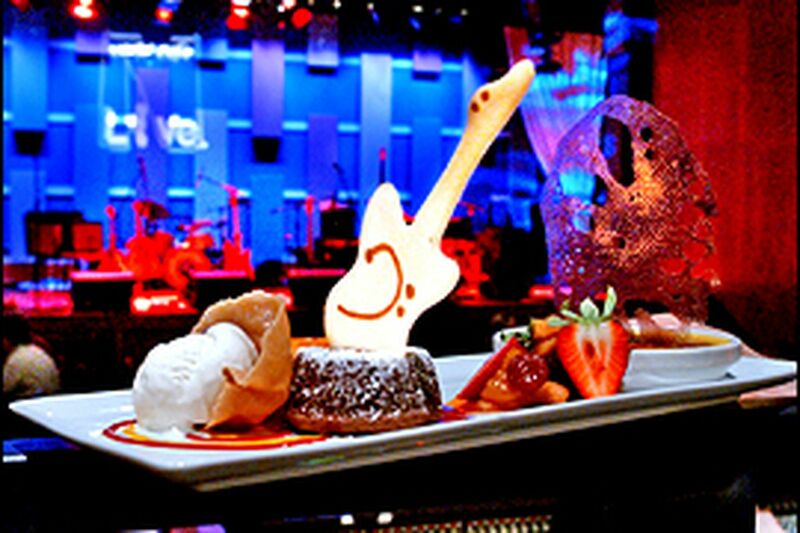 The WXPN public radio station occupies one side; two separate performance venues on the other make up the World Cafe Live. Technically distinct from the nonprofit radio station and the show of the same name that is its flagship program, the World Cafe experience is nonetheless snugly tailored to the 'XPN audience. Both the sunny 100-seat coffeehouse upstairs and the 300-seat auditorium-style club downstairs feature hip adult rock bands leaning toward folk, blues and world music. And both rooms are Volvo-ized for sleek baby-boomer comfort - colorful, contemporary, and acoustically stellar. The place is so cushy, though, that I found the large venue a bit sterile for a music hall that wants to rock. And with long cafeteria-style tables filling the room, it vaguely recalls a gussied-up high school gymnasium. The format, in its essence, works well enough for performance-time dining. But the menu can't seem to find the right pitch. With the tables lined up perpendicular to the stage, sight lines are unobstructed, and attention is directed respectfully toward the music. The Cafe's servers were surprisingly sharp - impressively informed, thoroughly outgoing, quick on their feet, and unobtrusive during performances. If only the kitchen could master the peculiar pacing that dinner here demands. It's no small task to handle a sudden rush for 300 meals, and the World Cafe, already on its second chef since opening in October, is still trying to get it right. Current chef Al Anderson, a South Philly native and Coast Guard vet who has cooked from San Francisco (Boulevard) to Honolulu (Alan Wong's), correctly insists that the menu must be easy to execute quickly. And he showed a few glimpses of what can be done by crafting some tasty specials to the theme of the evening's music. With the locally based world-fusion group Jaffna jamming on their tablas and acoustical strings a la John McLaughlin, I savored an intriguingly curried lentil soup, then moved on to tender lamb chops with cuminy merguez sausage and fruit-studded couscous. The rest of the menu, though, was a slap-dash effort. This despite the fact that each item is gilded in pretentious menu buzzwords and presented on ridiculously giant plates streaked with balsamic vinegar. "Pretzel"-crusted chicken was essentially a tasteless fried chicken cutlet. The catfish po'boy was cooked until the fish had nearly disintegrated inside its armorlike crust. The "mini burger duo" brought two fistfuls of disappointment - all bun and cheddar, with an afterthought of flattened, gray freezer section-style patties sitting in for "medium rare" meat. The chopped-up bits of dry meat in the chicken cheesesteak topped with inedibly bitter broccoli rabe were not worthy of my local pizzeria. Such low notes are all the more frustrating because better food would instantly make this entire venture a more convincing success. And the kitchen has occasionally shown that it's capable of a better performance. Fried calamari, a tavern staple that is commonly botched, were excellent, tender and crisp, tossed with salty olive salad. The paella wasn't exactly authentic, but it was satisfying nonetheless, a huge portion of saffron rice topped with plump shrimp, tender clams, and hearty links of sausage. A grilled rib-eye steak special was plain but reasonably flavorful, with fluffy mashed potatoes and ratatouille. The pulled pork was also unadorned, but admirably tender, and served with a barbecue sauce that gave it more than enough jazz. Just when I thought the kitchen was about to settle into harmony, though, carelessness tripped it up. On two separate occasions, the "soup of the day" was served lukewarm. A seared tuna entree brought a nice piece of fish, but the "soba noodle" salad was replaced with undercooked rice noodles that were dressed in an achingly sour Asian vinaigrette. At least the desserts from accomplished pastry chef Michael Vandergeest should be a sure-fire finale. I loved the whimsical guitar-shaped cookies and chocolates that garnished his updated takes on such homey sweets as the brownie sundae, lemon cheesecake, and warm apple cobbler. But why, I wonder, were normally hot desserts such as the delicious rum raisin bread pudding and molten chocolate cake still cool in the center? Obviously, they didn't spend enough time heating up next to Landreth's amplifiers on stage.